Pick up to 120 large square bales per hour with the 16K PLUS. Features like loading two bales per loader cycle, pick bales from any direction and unload up to 12 bales means one operator can move bales with amazing speed. The 16K PLUS is built tough for demanding conditions and years of reliability. The 16K PLUS is ideal for stacking wet or dry 3x3 bales, 3x4 bales and 4x4 square bales. The computer operation simplifies picking and makes stacking faster. To pick up and load bales the operator toggles only the loader switch. The computer determines the motion of the Alignment Arms, Loader, Grab Hooks and Power Slide depending on the position of the loader switch and the position of the bales through the loading cycle. This feature moves the 16K PLUS to the right of the truck or tractor so bales be easily seen for pick up. 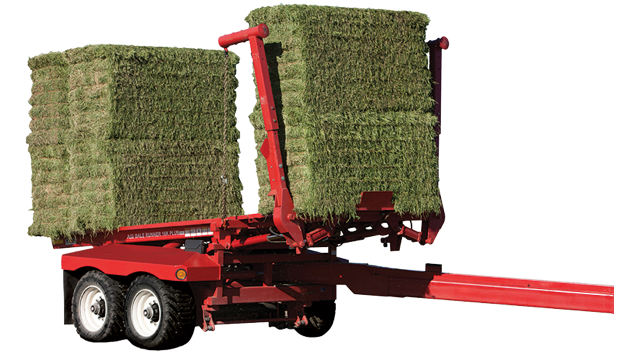 With the Auto Align® feature, bales can be slid sideways or turned to fit between the arms. The alignment arms center the bales first; the grab hooks lift and holds the bale in place up and off the ground in order to pick up the second bale. After two bales are raised to the up position, the operator opens the alignment arms to signal the slider to move the bales back. The power slider foot grabs the bottom of the bale to eliminate tumbling of bales. The power slider has a heavy-duty no deposit schedule 80 chain. After the bales are all the way back, the computer resets the loader to prepare it to pick up more bales. The power slider works for wet and dry bales. It is fast and easy to make straight stacks by using the hitch to steer the 16K PLUS while backing up to an existing stack. Once the bed is vertical, open the alignment arms, activate the push-off and drive away. Activate the switch to lower the bed and the computer will automatically retract the push-off, lower the bed and return the 16K PLUS to the inline position for travel. The 16K PLUS features a push-off that when activated assists in moving bales off the forks as you drive away. The 16K PLUS features heavy-duty running gear connected to the frame with leaf spring suspension. All 16K PLUS come with standard high flotation tires and tandem axles. The dual axles can also be equipped with optional air brakes. The 16K PLUS Bale Runner is under 10 feet wide. All 16K PLUS Bale Runners come with standard brake lights and fenders.